BYU football • Lack of explosiveness and lack of early urgency have been problematic. Rick Egan | The Salt Lake Tribune Brigham Young running back Jamaal Williams (21) run the ball for the Cougars, in second quarter action, BYU vs. Utah at Rice-Eccles Stadium, Saturday, September 10, 2016. 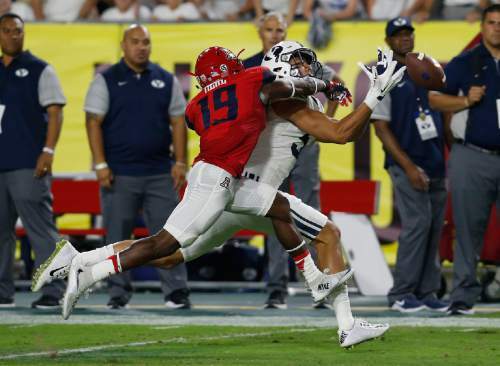 Arizona cornerback DaVonte' Neal (19) breaks up the pass intended for BYU wide receiver Nick Kurtz during the first half of an NCAA college football game, Saturday, Sept. 3, 2016, in Phoenix. (AP Photo/Rick Scuteri) Rick Egan | The Salt Lake Tribune BYU offensive coordinator Ty Detmer talks to the media at the annual football media day at the Broadcasting Building,Thursday, June 30, 2016. Rick Egan | The Salt Lake Tribune Brigham Young Cougars quarterback Taysom Hill (7) is hit by Utah linebacker Sunia Tauteoli (19) as he runs the ball for the Cougars, in football action, at Rice-Eccles Stadium, Saturday, September 10, 2016. 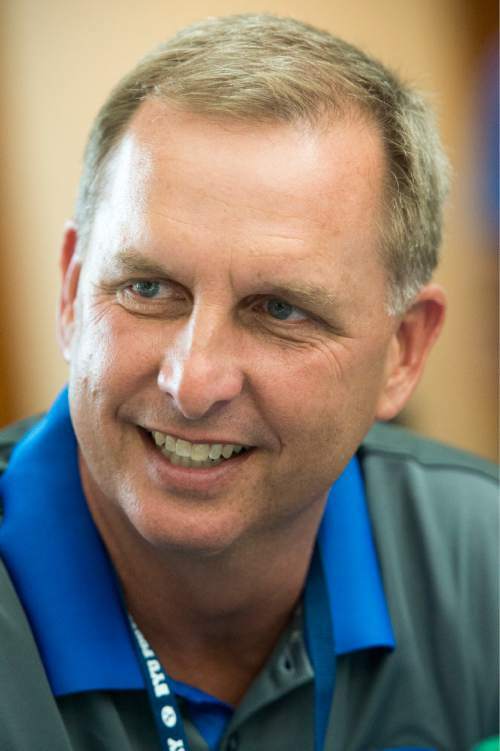 Provo • Ty Detmer&apos;s second weekend as BYU&apos;s offensive coordinator was one of the longest of his life, the former Heisman Trophy winner said Wednesday, reflecting on the failed two-point conversion play in the 20-19 loss to Utah. 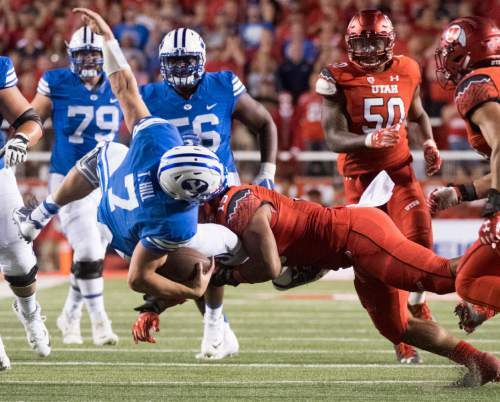 "It was a long Saturday night, and [long] Sunday," Detmer said, blaming himself for not having a pass option built into the quarterback draw play by Taysom Hill that was stuffed by the Utes a few yards from the goal line. "It wasn&apos;t so much the play, it was not having the options available off of it. That was the thing that was disappointing, because I know better than to [call] just an all-or-nothing type of play." Detmer said he discussed several plays during the timeout with Hill and his staff, but in the end Hill "wanted the ball in his hands, so I reverted to that one." Still, the former BYU quarterback in his first year as the offensive coordinator took the blame, and credited Utah for using a different defensive alignment than it had the entire game. "So that&apos;s on me as the play-caller, not having that option available to [beat a full blitz], and obviously we will have that in place going forward," he said. That particular play wasn&apos;t the only time BYU&apos;s offense struggled in the first two weeks. Detmer, Hill and the Cougars (1-1) continued preparations on Wednesday for Saturday&apos;s 8:15 p.m. home opener against UCLA knowing that less than 20 points a game won&apos;t get it done against the Bruins (1-1). "We just need to be cleaner," Hill said. "As we went back and watched the film, it was like, on every play there was one guy who wouldn&apos;t do his assignment, and wasn&apos;t assignment-sound. It is hard to execute at a high level when you are playing a good defense when those things are going on. So, as we move forward, we have to make sure that all 11 guys know what their responsibility is and take care of that." It&apos;s not what BYU fans envisioned when Detmer got the job last December, although players and coaches acknowledged Wednesday that they&apos;ve faced two strong defenses. The Cougars are 86th in the country (128 teams) in total offense, averaging just 371.5 yards per game. The most glaring weakness has been the lack of big plays: BYU is the only team in the country with no passing play of at least 20 yards and is 121st in the nation in yards per completion at 9.0. "We are just ready to make plays," said senior receiver Mitchell Juergens. "We are ready to put it in the end zone and kind of break out as an offense." But how? 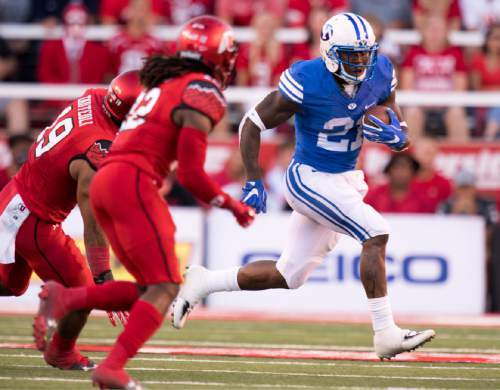 Running back Jamaal Williams, who missed parts of the Utah game with an undisclosed injury or ailment but should play Saturday, is the offense&apos;s only big-play threat. The receiving corps is loaded with possession-type receivers such as Juergens, Nick Kurtz and Moroni Laulu-Pututau, but lacks an experienced burner until junior college transfer Jonah Trinnaman finds his way. Detmer said he&apos;s confident that Hill is still the man for the job, after the senior beat out sophomore Tanner Mangum in fall camp. "When you go back and watch the film, [Hill] is playing well," Detmer said. "He is playing within the system and the framework. We just need to try to create more of those opportunities for ourselves." Detmer reiterated what he said after the 18-16 win over Arizona in which Hill directed the game-winning field goal drive. "I am not into the stats and where the offense ranks and all those things," he said. "If we are giving ourselves a chance to win every week, that is what we want, is an opportunity to win the game." Detmer hasn&apos;t lost his sense of humor through all the second-guessing, saying "maybe just go two-minute [drill] the whole game," when he was asked what he learned after BYU&apos;s offense came alive in the final minutes against Arizona and Utah. "When we were in a hurry-up mode last week we were pretty efficient," he acknowledged. Those uptempo situations notwithstanding, Robert Anae&apos;s "go fast, go hard" offense is a thing of the past. The Cougars are averaging a play every 26.9 seconds, which ranks them as the 92nd-fastest offense nationally. "I think, as an offense, we need to develop that instinct and right now we don&apos;t have it," Hill said, alluding to the successful two-minute drives. "I think maybe we can be a little more aggressive earlier in the game in terms of play-calling and in terms of me as a quarterback taking shots earlier knowing we need to move the ball, and have that same sense of urgency." Total Offense	86th	371.5 ypg. Rushing Offense	68th	178.0 ypg. Passing Offense	89th	193.5 ypg.